I won an ARC of this beautiful book (just look at the cover) at a giveaway from Writeoncon. Twists and turns in the book kept me reading until 1 am one night, and I had no idea what would happen next. The Revenant is a haunting ghost story with historical fiction and a good dose of hopeless romance thrown in. Much of the book resonated with Anne of Avonlea and since I am a huge fan of Anne, I felt very much at home between the pages of the book. Paranormal elements blended naturally with the historical aspects of the story. Set in the 1800’s at a female seminary for Cherokee girls, the book is rich in setting and background. In fact, I wished that Gensler had included more of the politics and difficulties that were prevalent for the Cherokee at that time period. Seventeen-year old Willie grows from impulsive to responsible as you follow her story. She falls in love with Eli Sevenstar, a handsome boy who shows interest in her. The only problem is, she is a teacher and not allowed to fraternize with students. How can a reader resist the forbidden romance? The river becomes a character in the book, adding a layer to the already gripping storyline. The climax of the book is intense and brings all of the elements of the book together. After the gripping climax, the story slows way down. At first I wanted the pace to speed back up, but I enjoyed the leisurely catharsis to the end. 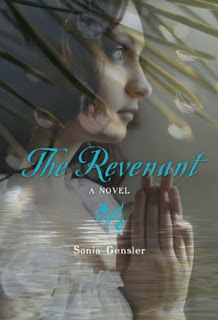 Look for Sonia Gensler’s fresh and promising debut to release in June of 2011.